I knew when creating my new craft space I was going to need to dedicate more space for thread storage. I came up with this DIY and had to show you how easy and functional it really is. The total cost to make this thread storage rack was under $5, and if you can move your arm back and forth you have all the skills required! By using quarter round moulding you already have the proper angle to achieve a slanted thread rack which is ideal for visibility and access. -Using a handsaw cut quarter round to desired length (mine are about 3′ long). 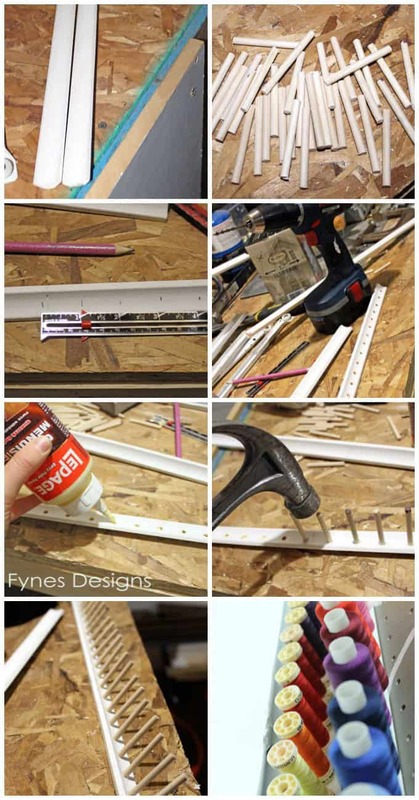 -Cut dowels into 2′ pieces, sand one end. -Drill holes (the trick I use to find the right drill bit is, I stick the dowel in the hole of the drill bit holder, if it just fits in, I know it is the right one). -Put a small dab of glue in each drilled hole. -Use a hammer to lightly tap the dowel pieces in each hole. Allow the glue to dry. -Hang on the wall with screws or nails. 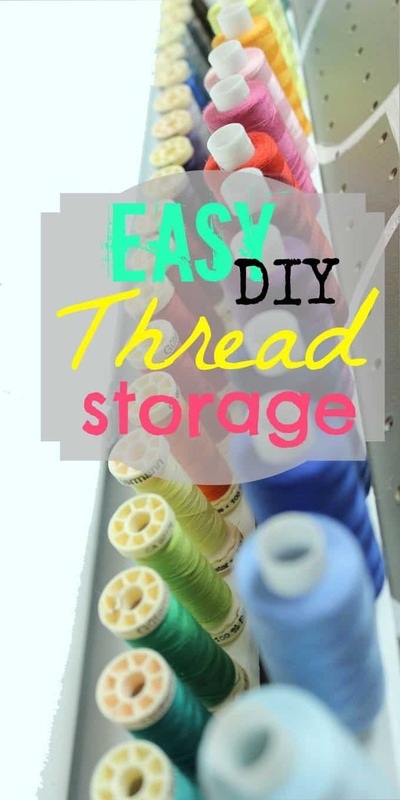 Just drop your spools onto the dowels and you’ve created the perfect thread holder. There are a tonne of great thread storage ideas on Pinterest . 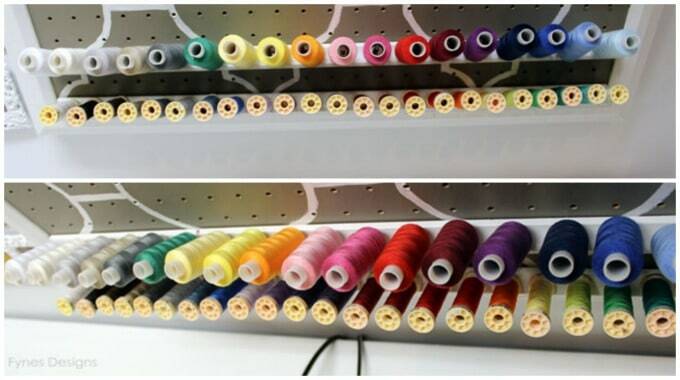 How do you organize and store your thread? Another great project! Can you take a wider view photo with the whole thing in it and post it? Thanks Claudine. I’m getting geared up to reveal my whole craft room where there will be a larger photo. It was hard to get a decent shot without showing off the entire sewing wall. Keep posted, only a week away! oooh i think i have some quarter round left over from our home reno,i will make the dowels a bit longer to hold a matching bobbin too i think.Thanks for posting! That is a genius idea! I should have thought of that, my bobbins are floating around a drawer! don’t glue in the dowel rods then you can adjust for any size spools. Great idea. I love this idea but is it good to store all your thread out in the open like this? Right now I store my thread lined up in 3″ deep boxes. The boxes are sorted by reg. thread, serger thread, embroidery thread. Sometimes it is a long time before I get to use certain threads and that is why I question leaving them exposed. Hi, Love your idea and plan to use it. Just to clarify for those who might go looking for the molding. The molding pictured is cove molding or it might also be called inside corner molding and is usually a bit flat on the back — like the V had its bottom cut off. Quarter round looks like a quarter of a circle from the end view so it has a corner on the back so it would not lay flush against a surface like the peg board. This comes from a 40+ year sewer/crafter that became her own trim carpenter out of necessity with the purchase of our first home in 1972! Again love your idea – all I have found to buy won’t fit the long skinny area I want to use it in. Just love it! Thanks for the tips Kathy! love your idea .I,m doing this for my new sewing room. wow! I need this i my life. my craft supplies and thread are taking over my house at the moment! lol. Actually no need to use longer pegs for the bobbins. Just put the bobbin first, and the sewing thread after. Oh my goodness, your a genius!! Why didn’t I think of that! How did you attach your concave round to the pegboard ?